Keep your computer clean and at top performance. Xvirus Personal Cleaner Pro 3.1 was available as a giveaway on February 17, 2017! 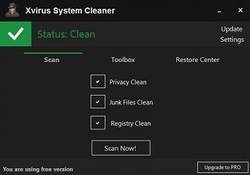 Xvirus Personal Cleaner Pro is an application designed to help you keep your computer clean and at top performance. With few mouse clicks you can clean up temporary files, browser history (with support for Internet Explorer, Google Chrome, Mozilla Firefox and Opera) cookies, cache and also registry entries that are wasting valuable space on the disk. 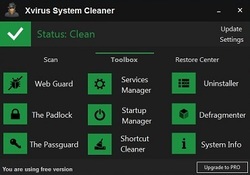 Xvirus Personal cleaner also includes a wide variety of 9 useful tools to protect your privacy and manage your system to your needs. With the Pro version you get access to auto scan and clean as well as Privacy Shield. License info: Lifetime with no updates. The person with the best improvement idea will get Lifetime license with updates! 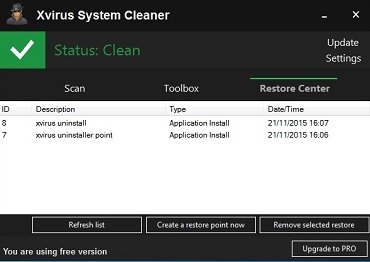 How would you improve Xvirus Personal Cleaner Pro 3.1? 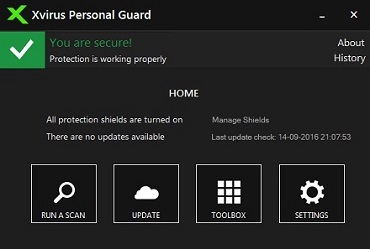 Add "scheduled tasks" editing under "Toolbox"
Xvirus Personal Guard is not the same as your common anti-virus solution, it was designed to block threats which your current anti-virus solution may not detect. This means you can use it alongside your current security software. 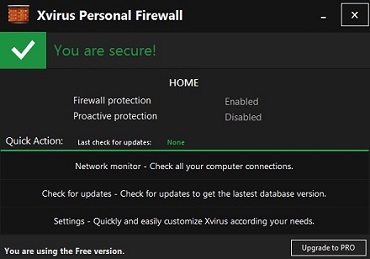 Anyone can freely use Xvirus Personal Guard by simply downloading and installing it. I got the download link from Give Away Of The Day on February 17 , but when opening the link it tells me that it no longer is active. Is GAOTD not allowing my personal computer to download the link? I got the download link from Give Away Of The Day on February 17 , but when opening the link it tells me that it no longer is active. Is GAOTD not allowing my personal computer to download the link? Limited cleaning features. Did not remove Memory Dumps which occupy significant disk space. There are better free apps out there which clean out the junk files and are more popular for a reason. Anil, Thank you for your comment, will be added in future versions. What a load of crap this site is. I'm able to click thumbs up but not thumbs down as it does not work. This has some issues that make it seem incredibly amateur/unfinished/broken. Run a scan, it says "scanning". When it's finished, there's no visual cue that it IS finished and continues to say "scanning"! You could spend the rest of you life waiting for it to stop "scanning"
After the above, you can click "clean" or "cancel", no back button. And clicking cancel to go back gives an error message. It doesn't recognise my Chrome based browser. The toolbox section has "The padlock", "The passguard", which ask for a password with no explanation what they are. Following on from above - there's no basic help file, contextual or otherwise. Clicking "Startup manager" opens does not open a startup manager, opens "Xvirus startup manager" with options to calculate boot time or optimise boot time. Bizarrely clicking "optimise boot time" THEN gives you a startup manager, and does NOT optimise boot time, just shows you the same as msconfig in windows so you can select deselect startup programs. The defragger is COMPLETELY broken. Button doing nothing, errors on attempting to scan, scan window not closing. All in all they've got a cheek charging for this mess. They're either terrible programmers or chancers hoping to make a quick buck from something they just threw together in an afternoon. One of the worst programs given away here. This has some issues that make it seem incredibly amateur/unfinished/broken. Examples: Run a scan, it says "scanning". When it's finished, there's no visual cue that it IS finished and continues to say "scanning"! You could spend the rest of you life waiting for it to stop "scanning" After the above, you can click "clean" or "cancel", no back button. And clicking cancel to go back gives an error message. It doesn't recognise my Chrome based browser. The toolbox section has "The padlock", "The passguard", which ask for a password with no explanation what they are. Following on from above - there's no basic help file, contextual or otherwise. Clicking "Startup manager" opens does not open a startup manager, opens "Xvirus startup manager" with options to calculate boot time or optimise boot time. Bizarrely clicking "optimise boot time" THEN gives you a startup manager, and does NOT optimise boot time, just shows you the same as msconfig in windows so you can select deselect startup programs. The shortcut cleaner doesn't appear to do anything, although this may be the same issue as the cleaner, ie doesn't tell you it's finished (although this also doesn't tell you it's scanning!) The defragger is COMPLETELY broken. Button doing nothing, errors on attempting to scan, scan window not closing. At least six out of the nine tools in the toolbox are just windows own tools, they offer nothing additional (possibly more, but I still have no idea what "The padlock" and "Passguard" are) All in all they've got a cheek charging for this mess. They're either terrible programmers or chancers hoping to make a quick buck from something they just threw together in an afternoon. One of the worst programs given away here. JDP, Thank you for your comment. Every program has bugs, it is impossible to make a 100% perfect program. Thanks. Xvirus, Bugs? This is beyond bugs, this is just shoddy design and programming. A bug is not something that is obvious to everyone that uses it, anything that obvious should be picked up by the developers. The fact that none of them were just shows lazy incompetence. How does this differ from yesterday's offering of Malware Hunter Pro? Morgan Pierce, I agree with many things that you've said (a bit an unfinished product), but come on it's free !! I'm sure ccleaner and glary utilities, once, were unfinished products. I remember when Glary Utilities, once screwed windows after running it on my first SSD drive...since the issue was fixed..they all have to start somewhere and we get it free to test it for them, and suggest some improvements. by the way padlock is for securing your files and folders with a password, and passguard is not bad actually, it for generating passwords for all your access user name. I did also suggest to them to have help files on hover over each module which they say they will do ?? Morgan Pierce, I agree with many things that you've said (a bit an unfinished product), but come on it's free !! I'm sure ccleaner and glary utilities, once, were unfinished products. I remember when Glary Utilities, once screwed windows after running it on my first SSD drive...since the issue was fixed..they all have to start somewhere and we get it free to test it for them, and suggest some improvements. by the way padlock is for securing your files and folders with a password, and passguard is not bad actually, it for generating passwords for all your access user name. I did also suggest to them to have help files on hover over each module which they say they will do ?? Great, it deleted every password I ever put in for logging into websites. This is a nightmare. Not sure how Xvirus is going to sort out this problem but attaching the brand's name to a $20 product that has nothing at all to do with viruses is, to put it mildly, unhelpful. It's also counter-productive: no sensible developer wants a potential customer's expectations to be frustrated from the outset, as may possibly be the case here. Either way: $20 for something new with no updates compared with $0 for something lonnnnng established -- CCleaner -- with regular updates, and one has to wonder why the developer thinks this product has a long-term future anyway. Thanks, GOTD, but no thanks. Not sure how Xvirus is going to sort out this problem but attaching the brand's name to a $20 product that has nothing at all to do with viruses is, to put it mildly, unhelpful. It's also counter-productive: no sensible developer wants a potential customer's expectations to be frustrated from the outset, as may possibly be the case here. Either way: $20 for something new with no updates compared with $0 for something lonnnnng established -- CCleaner -- with regular updates, and one has to wonder why the developer thinks this product has a long-term future anyway. Thanks, GOTD, but no thanks. 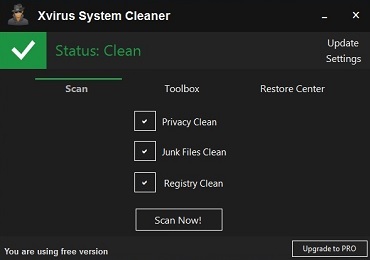 MikeR, the product also has a free version with all updates that will work just like Ccleaner. The difference is for Ccleaner you pay €20 for 1 year of the pro version with automatic cleaning. For Xvirus Personal Cleaner you pay €6 for 1 year or €20 for lifetime pro license with automatic cleaning. Xvirus, Have to agree with MikeR about your company name; confusing. Perhaps a contest to rename your company with some of your software up for grabs; just a suggestion. Why all the "no" votes. What the Xvirus rep says it true; I spent a good part of the afternoon researching it. Even at twenty Euros it's less expensive than CCleaner's one year sub; $21.21U.S. today. I'm not really interested in automatic cleaning and I'm still using CCleaner Free, but I'm willing to give this a try. Xvirus, Have to agree with MikeR about your company name; confusing. Perhaps a contest to rename your company with some of your software up for grabs; just a suggestion. Why all the "no" votes. What the Xvirus rep says it true; I spent a good part of the afternoon researching it. Even at twenty Euros it's less expensive than CCleaner's one year sub; $21.21U.S. today. I'm not really interested in automatic cleaning and I'm still using CCleaner Free, but I'm willing to give this a try. Xvirus, lets face it ... your product has bombed here. The concensus is that people think the product is a waste of time and money ... CCleaner has you beat hands down. tom, You can use more than 1 cleaning software. If you try use Xvirus Personal Cleaner after ccleaner it will detect somethings that ccleaner didn't. tom, based on the developers comments I tried Xvirus Personal Cleaner (XPC) because based on his comments it seemed as if XPC is as good as CCleaner. I really wanted to like this, but sadly I don't. I was going to make a point by point list of reasons I will continue to use CCleaner Free versus XPC, but I just don't have the time. The only two positives I found are 19.99 Euros ($21.22US today) lifetime license compared to CCleaner Pro annual subscription rate of $25US (23.55 Euro today). I stated earlier that I wasn't interested in automatic cleaning; what I meant is that I'm not going to pay an annual sub just to get auto cleaning; if it were an lifetime license with lifetime support I probably would. The only other positive is the UI; with that said I don't care about UI, the only requirement I have is that the software does what it says it will do and it's easy to navigate. CCleaner meets both those requirements. One more thought; I saw a comment about the lack of help files. To be fair CCleaner doesn't have help files, but then doesn't really need them. XPC has some tools that are vague and a help file would be beneficial. Sadly I cannot recommend XPC over CCleaner. tom, based on the developers comments I tried Xvirus Personal Cleaner (XPC) because based on his comments it seemed as if XPC is as good as CCleaner. I really wanted to like this, but sadly I don't. I was going to make a point by point list of reasons I will continue to use CCleaner Free versus XPC, but I just don't have the time. The only two positives I found are 19.99 Euros ($21.22US today) lifetime license compared to CCleaner Pro annual subscription rate of $25US (23.55 Euro today). I stated earlier that I wasn't interested in automatic cleaning; what I meant is that I'm not going to pay an annual sub just to get auto cleaning; if it were an lifetime license with lifetime support I probably would. The only other positive is the UI; with that said I don't care about UI, the only requirement I have is that the software does what it says it will do and it's easy to navigate. CCleaner meets both those requirements. One more thought; I saw a comment about the lack of help files. To be fair CCleaner doesn't have help files, but then doesn't really need them. XPC has some tools that are vague and a help file would be beneficial. Sadly I cannot recommend XPC over CCleaner. After installing it. I enter the key. Now you have to restart. Once I did that. It locks up Windows 10. Have to go to safe mode to delete the software. Getting some kind of DPC error from. 100% find now that I have fully removed this software. Wai, can you give more details on the error? Any blue screen, error message? 4. Like some one said, you have to reboot after entering the key. So, I reboot. 5. around 5-10sec later. Mouse frozen, nothing works and then windows 10 BSD. "DPC Watchdog Violation error"
6. Was able to get in to safe mode and remove xvirus. 7. Not sure why problem still exist. Chrome was out of the screen. So, I wasn't able to use it. MSI gaming app doesn't start up. 8. Was able to use one of my very old Restore point. Every thing is working again. Well this is the step: 1. download the file. 2. installed xvirus 3. use it, enter the key 4. Like some one said, you have to reboot after entering the key. So, I reboot. 5. around 5-10sec later. Mouse frozen, nothing works and then windows 10 BSD. "DPC Watchdog Violation error" 6. Was able to get in to safe mode and remove xvirus. 7. Not sure why problem still exist. Chrome was out of the screen. So, I wasn't able to use it. MSI gaming app doesn't start up. 8. Was able to use one of my very old Restore point. Every thing is working again. After putting in the key, and then restart the PC. Around 5-10sec later. Windows 10 BSD, 0% to 100%. and then it say "DPC Watchdog Violation error" no error code. Uninstalling the software actually didn't work. I have to use old Restore point and that fix the issue. After putting in the key, and then restart the PC. Around 5-10sec later. Windows 10 BSD, 0% to 100%. and then it say "DPC Watchdog Violation error" no error code. Uninstalling the software actually didn't work. I have to use old Restore point and that fix the issue. Wai, Maybe another thing was causing it. In my personal computer that already happen to me when I overclock the graphics card too much using MSI afterburner. Hope it helps. I was impressed with the execution speed. If there is one improvment that I could suggest, is to have Help files built in into the software. Just a quick description for each module, for example I didn't know what padlock and passguard do, until I researched it. For example you could have something like: "Padlock will help you to secure your files/folders with a password. Start by creating a master password for this module." This message can be displayed when you hover over the Padlock Module. Kami Ilmane · Internet Marketer at Internet Marketing I was impressed with the execution speed. If there is one improvment that I could suggest, is to have Help files built in into the software. Just a quick description for each module, for example I didn't know what padlock and passguard do, until I researched it. For example you could have something like: "Padlock will help you to secure your files/folders with a password. Start by creating a master password for this module." This message can be displayed when you hover over the Padlock Module. kami, Thank you for your suggestion. Will be added on next version. It requires .NET Framework 4 in compatibility mode to work, no thanks. Boy, you sure showed them. Sue, Boy, you sure showed them. I have never heard of an anti-virus as a giveaway that includes a lifetime license but no updates! Probably much better off with any of the absolutely free anti-virus packages available. I will pass on this one! oops! I too was under the impression that it was an anti-virus product! I agree C Cleaner does all of it and the free version gets as many updates as the paid version! Richard, you must be very new to this site, the GIVEAWAY versions are always time limited. The people who work so hard to create software need to have a paycheck just like you do. They use this site to test their software and to get feedback on how to improve it, it isn't here just to give you something for free. TANSTAAFL! The lifetime license merely means that the program will keep working long after one year from now, it just won't update - for that you buy the software at the end of the year, and you get the benefit of having a whole year to decide if this is the software you want to use to keep your computer safe. Richard, the paid version gets all updates just like the free version. Only the license from the giveaway won't get any update. 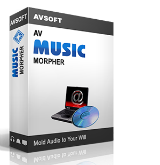 You can choose between keeping it, update and use the free version or buy a license for the pro version with all updates. Larry, I doubt Richard is new to GOTD. And he wasn't referring to general giveaway terms anyway. . . but to the giving away of an anti-virus which never gets updated. Obviously, no AV from any developer remains without updating, otherwise there'd be no point in having it. Richard now realises this isn't an anti-virus software at all but a cleaner. Larry, I doubt Richard is new to GOTD. And he wasn't referring to general giveaway terms anyway. . . but to the giving away of an anti-virus which never gets updated. Obviously, no AV from any developer remains without updating, otherwise there'd be no point in having it. Richard now realises this isn't an anti-virus software at all but a cleaner. Larry, I have been enjoying GOTD giveaways for many years, I am not new to it. I have, as a result of my trials here, become a loyal cash customer to several companies whose products I have previewed on GOTD, so it does work for software developers. I am assuming that you work for or are the developer of the product. If so, my advice, as a LONG TIME user, is to offer a limited duration subscription, but with updates. As it is good for the hopefully eventual customer to see the update process and how simple or complicated it is and how your computer will react..seriously, what good is a lifetime license to software that will get outdated and is not update able, as new pests are discovered? Your defensive response was unwarranted..this is not a free lunch, but a free sample! Larry, I have been enjoying GOTD giveaways for many years, I am not new to it. I have, as a result of my trials here, become a loyal cash customer to several companies whose products I have previewed on GOTD, so it does work for software developers. I am assuming that you work for or are the developer of the product. If so, my advice, as a LONG TIME user, is to offer a limited duration subscription, but with updates. As it is good for the hopefully eventual customer to see the update process and how simple or complicated it is and how your computer will react..seriously, what good is a lifetime license to software that will get outdated and is not update able, as new pests are discovered? Your defensive response was unwarranted..this is not a free lunch, but a free sample! Richard, Larry does not work for the company and having no program updates doesn't mean it won't have database signatures updates. Just it won't have any bugs fixed. Larry, and this is fine for as long the applications offers something unique but not for an application that offer less than free alternatives. You see, the word 'free giveway' does not give the vendor special rights to do as he pleases, for this giveaway the vendor receives advertisment exposure and useful input. If the offer does not stand at the same level or better than free alternatives, it does not deserve any positive comments even when it is offerd for free. Larry, and this is fine for as long the applications offers something unique but not for an application that offer less than free alternatives. You see, the word 'free giveway' does not give the vendor special rights to do as he pleases, for this giveaway the vendor receives advertisment exposure and useful input. If the offer does not stand at the same level or better than free alternatives, it does not deserve any positive comments even when it is offerd for free. But after entering the key and restarting the program, it still says "You are using free version" at the bottom, and still has "Upgrade to PRO" button. The scan is also extremely fast compare to other cleaners, but lacking information about scan results, and if you don't want to remove some files it found there is no way to uncheck them. Installation went amazingly fast. But after entering the key and restarting the program, it still says "You are using free version" at the bottom, and still has "Upgrade to PRO" button. The scan is also extremely fast compare to other cleaners, but lacking information about scan results, and if you don't want to remove some files it found there is no way to uncheck them. ew, my bad, i had to close it in the tray to restart, activation works! ew, but now it's showing the message "Xvirus Personal Cleaner is Updated!" at every start. ew, You can select the items you want to remove or not by clicking in details> settings>scan and unselect what you dont want to be cleaned. Showing the update message every time is a bug that will be fixed soon. Xvirus, thank you for kind replies to previous questions. You answer, that I can unselect what I do not want to be cleaned does not explain what is essential for such program. Do you mean that (1) I may select/unselect before the scan begins and then there is nothing I can do if I missed to unselect a class of items, or (2) does your advice refer to the display of files AFTER the scan is completed and before the entries, files etc. are eventually cleaned? Option (1) is not satisfactory at all. Option (2) – yes. Marek, (2) Before the scanning you can select what you want to scan on the settings, after the scan is complete you can use the settings>scan tab to select what to clean. I said nothing beats ccleaner - so why delete my 1st post? Appears there's no free speech at G.O.T.D. I said nothing beats ccleaner - so why delete my 1st post? Appears there's no free speech at G.O.T.D. ms , If you think that's a farce then check your post using a different browser or PC than you originally posted from. You may just find it really was NOT posted at all and will only show from the same PC and same browser! I have tested this many many times and have found very fraudulent results from giveawayoftheday! DRDNA, you mis understand, if you only see it in the same browser you posted it with but not in any other browser on the same or other machine then the post WAS posted but is being held back awaiting the moderator to allow it through or delete it. If it vanishes on refreshing the page on the original posting browser then a moderator/admin deleted the post. Only when a post is viewable in all browsers is the post viewable by the public and even then it could be deleted if a different moderator/admin doesn't like it or has a mood swing! ms , this website is privately owned not publicly owned or funded so of course there is no expectation of freedom of speech which in many cases is a GOOD thing, in one infamous country freedom of speech/expression leads to criminals and morally bankrupt perverting a well intentiond constitutional ammendment into a license to publish filth and hate and abuse. Which country are you talking about? If you cannot say it, then you are using free speech to infer something, as you feel free to accuse but not name. By the way, I was simply trying to point out that one particular program was better than another, just "freely" stating a fact, but the post was deleted. TK, Which country are you talking about? If you cannot say it, then you are using free speech to infer something, as you feel free to accuse but not name. By the way, I was simply trying to point out that one particular program was better than another, just "freely" stating a fact, but the post was deleted. Have a nice weekend. The company name Xvirus confuses the product identity! When the product is nothing to do with viruses they should trade non virus products under a different brand / "trading as" name. TK, because the brand has Xvirus in the name it doesn't need to be 100% related to virus protection. We have 2 kind of products: Protection and Cleaning. But thank you for your opinion. Xvirus, even 1% related would be a good start but as far as I see there are no virus cleaning facilities for this Personal Professional Xvirus Cleaning product or the firewall, is it For Personal use or Professional use virus related in any way cleaning? It just seems VERY confused! Xvirus, It makes it very confusing at what you're trying to sell. To me (and many others I'm sure) Xvirus kinda means NO virus... like an antivirus. Now I know this is your BRAND name, however it is very confusing on a quick glance, and i really don't want to look up someone's brand name to find out out though their name has Virus in it, it doesn't work as an anti virus. It's like saying come to the car dealership to buy lunch.....? Xvirus, It makes it very confusing at what you're trying to sell. To me (and many others I'm sure) Xvirus kinda means NO virus... like an antivirus. Now I know this is your BRAND name, however it is very confusing on a quick glance, and i really don't want to look up someone's brand name to find out out though their name has Virus in it, it doesn't work as an anti virus. It's like saying come to the car dealership to buy lunch.....?